What Characters Should Get a Spin-Off? Since "Sailor Moon" is technically a spin-off of "Sailor V," I thought it would be fun to discuss who you think should get their own spin-off series next? This is the most obvious and frequently discussed idea for a sequel/spin-off series. Presumably set in Crystal Tokyo, such a series would focus on Chibi-Moon, the Sailor Quartet, and probably also Saturn and Helios having their own adventures. This could be a prequel focusing on Haruka and Michiru's awakening as Sailor Soldiers and fighting monsters prior to the Infinity arc, or it could be a Silver Millennium-era set or future set series about Uranus, Neptune, and Pluto guarding the Outer Solar System from extrasolar enemies. Or perhaps it could be about something else entirely, like just Haruka, Michiru, and Setsuna raising Hotaru and living their best lives. How about a series focusing on the lives and tribulations of the Sailor Team from Kinmoku? This could be a prequel series about his time as a phantom thief, a sequel series about him and the Four Heavenly Kings, or something else entirely. How about a spin-off series about Mnemosyne and Lethe? Or Sailor Coronis or any of the other Sailor Soldiers introduced/alluded to in Stars? A Sailor Cosmos sequel spin-off? A spin-off about the Ayakashi Sisters? Or one about the Supernatural Research Club? Pretty Demon Fighter Sailor Mars! About Rei travelling around Tokyo, fighting demons, exorcising evil spirits and lifting curses with Phobos and Deimos as her sidekicks, Grandpa and Kotono as the supporting cast, and the other senshi as occasional guest stars. I always wish Saturn to have her own show - one that depicts the different & similar circumstances of her each awakening & then elimination of everything in the seemingly endless history of time. I personally vote for the Sailor Chibi Moon and the Sailor Quartet series as I think that would make a neat next generation story. My personal vote is for Other, because there are so many side characters and alternate stories I would prefer to explore. I would love to see a Crystal Tokyo spinoff, but I would not want it to center on Chibi-Moon & the Sailor Quartet (because of the latter four). I'd rather it focus on the current iteration of Sailor Guardians and how they would grow into their roles in the future. I'd also like there to be an exploration as to whether or not these girls eventually become queens in their own right as the Chibi-Moon & The Quartet take over active fighting, or if the two groups co-exist, if there is any form of succession at all, if there is any lingering drarma from the Black Moon arc, etc. Alternately, I would love to see a Silver Millennium spinoff that focuses on the various Moon Kingdom politics and the balancing of the princesses' royal duties with their Guardian duties, with a fleshing out of the founding of the Silver Millennium, Nehellenia's curse, Adonis, Earth/Moon politics and such. Yes, I know I said in other threads that I prefer Beryl with little backstory and I am not a fan of "Sen/Shi" pairings, but if I get more knowledge about the "good old days" then I'll deal with it. However, I would like to see an anime-continuity based spinoffs about the side characters, filler characters, and the redeemed villains. I would love to follow the story of Naru and Umino as well as the other classmates who were Usagi's friends. I would like there to be a follow-up with Haruna and Usagi's Earth family. I would like there to be a follow-up with the Rainbow Crystal carriers other than Rei's grandfather and Reika. I would love to see how Ail and En put their second chance to life, and what if one of the new children of the Makaiju were a Sailor Guardian? I would like to know more about Makoto's old school, her sempai, and her classmates. Most of all, I would like to see all of these characters interact in unexpected ways. What if, for instance, Makoto's classmate continues her work, but still lacks confidence, but then she comes across Yumeni Yumeno who helps her deal with her confidence issues, and the two begin a collaboration? I want to see what the supporting cast is up to, even if their happenings come across as "Lower Decks" episodes. I would like there to be a follow-up with the Rainbow Crystal carriers other than Rei's grandfather and Reika. I'd like to see a follow-up on Rhett Butler's new romances or love adventures after Luna. I voted for a Chibi Moon spin off because I think that would be the best way to introduce new storylines and new characters and keep exploring the Sailor Moon universe and I'd love to see Chibi Moon in a leadership role. A spin off about the Sailor Wars would also be exciting especially if it was focused on all the Sailor Guardians Naoko introduced in Stars. An Outers prequel would be interesting but I feel like it would work better as an OVA special than a full length series. I think a full length Outers prequel would suffer from the same problem a lot of prequels suffer from where you know nothing too threatening will ever happen to the Outers because of the necessity of the plot. I really want to see a spinoff on the Starlights. Knowing more about his psychic powers would be nice. Sailor V of course. Even just an adaptation of the manga would be nice. I'd love a Sailor Cosmos spinoff! It could go into detail how she became Sailor Cosmos, what happened to Usagi's loved ones that made Sailor Cosmos have to fight alone, Sailor Cosmos's battles against Chaos, how Chaos became Sailor Chaos, how Sailor Cosmos could lose enough hope to tell Eternal Sailor Moon to destroy the Galaxy Cauldron, and a little bit about how Sailor Cosmos continued fighting after meeting Eternal Sailor Moon. I would also like a spinoff about Queen Serenity. How come she's on the Moon? (I think that was addressed in Suburban Senshi). How come she could use the Silver Crystal if it's Sailor Moon's Sailor Crystal? 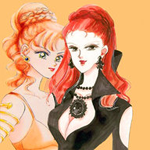 Sailor V anime. Could be used to tell us whatever happened to Hikaru and Amano. What Minako does when nobody's looking: superheroing with Usagi as her sidekick, working with the police, and so on. 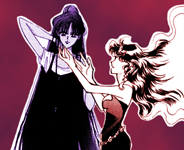 Could be used to shed light on Minako's surprisingly mysterious past. The ninja adventures of the Tsukino family (because between their income too low for where they live and what Usagi pulls sometimes, it's more likely they're undercover ninjas). How do we know their income it too low for where they live?